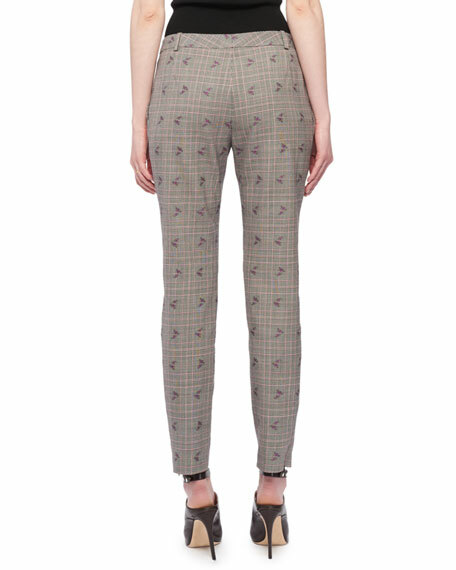 Altuzarra "Henri" trousers in Prince of Wales check with floral embroidery. Approx. measurements: 8.2" rise; 28" inseam; 37.5" outseam. 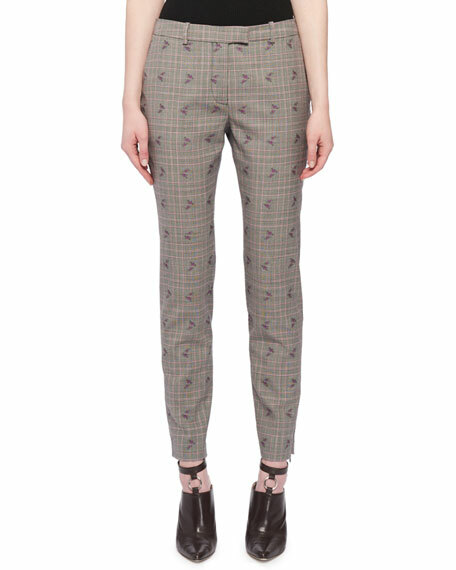 Etoile Isabel Marant "Noah" trousers in tonal-check. High rise; belt loops. Side pockets. Back button-welt pockets. Slim fit through straight legs. Cropped hem. Hook/zip fly. Virgin wool. Made in Bulgaria. Model's measurements: Height 5'10"/177cm, bust 33"/84cm, waist 25.6"/65.2cm, hips 35.8"/91cm, dress size US 2-4/FR 34-36. Rosetta Getty pants in stretch-cady. High-waist; flat front. Hidden side zip. Relaxed fit. Wide legs. Viscose/spandex. Dry clean. Made in USA of Italian materials. Model's measurements: Height 5'11"/180cm, bust 31"/79cm, waist 23"/58cm, hips 34.5"/87cm, dress size US 0/2. RtA "Dillon" sequined pants with front belt detail. High-rise paper bag waist. Side slash pockets. Fitted through straight legs. Full length. Hook/zip fly. Polyester. Viscose/polyester lining. Dry clean. Imported. Model's measurements: Height 5'10.5"/179cm, bust 32"/82cm, waist 23.5"/60cm, hips 34.5"/88cm, dress size US 2.